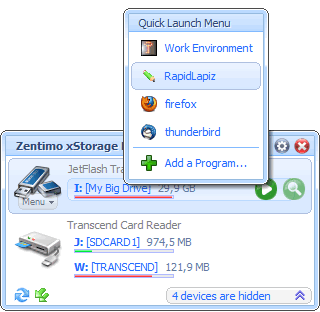 Using Zentimo you can call your portable apps (apps launched from the removable drive) easily and quick. This ability is provided by Zentimo's quick launch menu which is available from the launch button that is displayed when you hover over drive in Zentimo device menu. How to add an app to quick launch list? 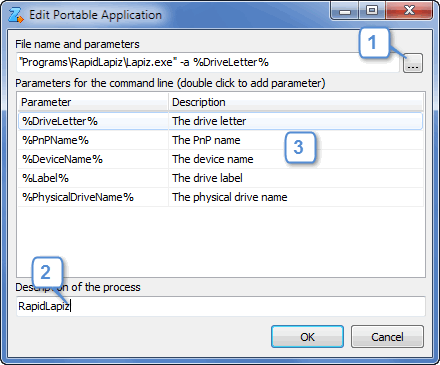 In the displayed dialog (1) select file to launch, (2) edit program description (how it will be displayed in the quick launch list), (3) add optional parameter templates to the process command line and click "OK". 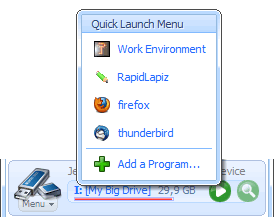 Just click the launch button ( ) of a drive and click your program from the list. 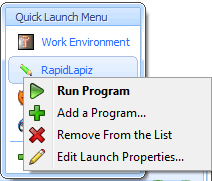 Right click to a program you wish to remove from the list or edit and choose a required item from the displayed context menu.